The primary burst of Ab and germinal center (GC) formation in response to T-dependent Ag is compromised in aging mice. Here we examine the effects of aging on the post-GC phase of memory B cell differentiation and the late Ab repertoire maturation in bone marrow (BM) in mice immunized with a hapten nitrophenyl coupled to chicken γ-globulin. Specific Ab-forming cells (AFC) with mutated VH genes accumulated preferentially in the BM of aged mice, although the AFC numbers and average number of mutations per VH were lower, and the D gene usage was less restricted compared with those in the young animals. However, the repertoire of AFC after an Ag boost demonstrated the hallmarks of Ag selection, including the recurrent mutations and canonical VD rearrangements, similar to the late primary response in young animals. It is postulated that the Ab repertoire maturation in aged mice is delayed and may be notably improved by repeated immunizations. Aging is marked by functional impairment of the adaptive phase of the Ab response in both humans and laboratory animals (1, 2). The aged immune system tends to generate Abs with lower avidity and/or affinity compared with young controls (3, 4, 5, 6, 7). Thus, even if the response of am aged organism to a specific Ag remains vigorous, the Abs are functionally insufficient and fail to protect against infection (8, 9, 10). One of the mechanisms of age-related immune dysfunction appears to be related to the germinal center pathway of Ab response. Germinal centers (GC)3 are formed in B cell follicles in lymphatic tissues within 1 wk after Ag exposure. The GC B cells, which undergo cycles of somatic hypermutation in their B cell Ag receptor genes, followed by affinity-based selection, are the progenitors of memory B cells as well as the cells that produce the Ab with higher affinity during the progression of the immune response (11). Thus, the paucity of high affinity Ab in aged animals pointed to a defect in GC. Indeed, Tew and his colleagues (12, 13) found a delayed and diminished formation of GC in aged mice. Miller and Kelsoe (14) and Yang et al. (15) subsequently showed a reduced frequency of somatic mutations (14, 15) and altered clonal selection (15) in GC of aged mice immunized with a hapten, (4-hydroxy-3-nitrophenyl)acetyl (NP). These studies further revealed that GC dysfunction was linked in part to intrinsic changes in aging B cells as well as changes in aging Th cells (15), which play a pivotal regulatory role in the GC reaction. The initial bursts of Ab response and GC formation in the lymphatic tissue are followed by an extended period of Ab repertoire maturation and memory B cell differentiation that involves bone marrow (BM), which is a major source of Ig in both man and mouse (16). Animal experiments have shown that, 2–3 wk after the systemic immunization, specific Ab-forming cells (AFC) begin to accumulate in BM (16, 17, 18, 19, 20) where they persist for a long time (17, 21). The kinetics and magnitude of the BM AFC response is influenced by the immunizing dose of Ag (22) and use of adjuvant (23). Recent studies using NP hapten as a model Ag suggested that BM plays an important role in Ab repertoire maturation that continues for months after the involution of GC (18, 19, 20). Ag-reactive B cells and AFC in BM contain more somatically introduced mutations than their counterparts in the spleen (18, 20) and produce Abs with increasing affinity for NP (18, 19). The maturation of Ab repertoire in BM and the development of B cell memory appear to be differentially regulated. Smith et al. (24) examined affinity maturation of anti-NP response in mice expressing the bcl-2 transgene. They found decreases in somatic mutation as well as in affinity of Ab secreted by splenic memory B cells, whereas the BM AFC remained unaffected. A discriminatory effect of the bcl-xL transgene on the repertoire of GC B cells and BM AFC was reported also by Takahashi et al. (25). Studies from our laboratory have shown that the late, NP-specific Ab response in BM and the anamnestic response to Ag boost may be dominated by different B cell clones (20). These new findings prompted us to examine how aging may affect the repertoire of the post-GC phase of Ab response in BM and that of anamnestic response upon immunization with NP coupled to the chicken γ-globulin (NP-CGG). In mice with IgHb allotype, this response is dominated by cells that produce Ab with H chain encoded by the VH186.2 segment of the J558 gene family (26, 27, 28). Thus, we analyzed the V/D rearrangements and somatic mutations in VH186.2+ AFC in cohorts of young/adult (2- to 3-mo-old) and aged (20- to 24-mo-old) C57BL/6 mice immunized with NP-CGG. Results from young mice were reported in part previously (20). Here we show that aging BM accumulates more AFC with mutated VH compared with the spleen, and that the memory response in the old mice has the characteristic features of normal repertoire selection in GC. The implication of these findings for vaccination of elderly are briefly discussed. Strain C57BL/6 mice, young (2–3 mo old) and aged (19–21 mo old), were purchased from the Charles River Laboratory (Wilmington, MA) from cohorts maintained by the National Institute of Aging and maintained in sterile microisolator cages (Lab Products, Maywood, NJ). The aged mice had a healthy appearance, and no gross pathological changes were observed during the autopsy. NP or its analog (4-hydroxy-5-iodo-3-nitrophenyl) acetyl (NIP) (Cambridge Research Biochemical, Cambridge, U.K.) were conjugated to CGG (Sigma-Aldrich, St. Louis, MO) or BSA (Amersham Life Science, Cleveland, OH) as previously described (29). Mice were immunized with a single i.p. injection of 10 μg of an Ag in alum and challenged with 10 μg of a soluble Ag in PBS i.p. SRBC in Alsever’s solution (Colorado Serum, Denver, CO) were washed in DPBS and resuspended to 10% (v/v) in 0.1 M bicarbonate buffer, pH 9.4. Succinimide ester of NIP (Cambridge), dissolved in dimethylformamide (Sigma-Aldrich), was added to a final concentration of 25 μg/ml of SRBC, and the mixture was incubated at room temperature for 30–60 min. Cells were then washed and resuspended to 20% (v/v) in DPBS. Splenocyte suspension was prepared by mashing spleens in RPMI 1640 medium supplemented with 25 mM HEPES (Life Technologies, Gaithersburg, MD) and 0.5% BSA (Amersham). Bone marrow cells were recovered by flushing the femurs through a 23-gauge needle with the same medium. Lymphocytes producing the NP-specific IgG Ab were detected with a modified plaque assay (30) using SRBC coupled with hapten as described previously in detail (20). Briefly, a mixture containing 0.3% agarose in Basal Medium Eagle (Life Technologies), lymphocytes, NIP-RBC, goat anti-mouse IgM (Southern Biotechnology Associates, Birmingham, AL), and rabbit anti-mouse IgG (Sigma-Aldrich) was poured on petri dishes and incubated at 37°C in 5% CO2 for 2 h. The hemolytic plaques were visualized by covering the plates with guinea pig complement (Life Technologies). The hemolytic plaque assay readily detects the IgM-producing cells, whereas the IgG-producing cells become detectable in the presence of an exogenous anti-IgG Ab (30). The Abs added to the assay mixture were previously titrated to inhibit the IgM producers and to visualize the IgG producers, as previously described (20). For the isolation of single AFC from the center of the plaque, the cell suspensions were highly diluted to increase the probability of sampling one cell (20). On the average, 40–70% of samples yielded a PCR product using the specific primers (see below). In contrast, no products were obtained from random sampling of the RBC lawn. Serum levels of NP-specific IgG Ab that exhibit heteroclitic binding to the NIP analog were determined by standard ELISA techniques using NIP-BSA conjugate as Ag in solid phase and isotype-specific goat anti-mouse Ig labeled with HRP (Southern Biotechnology Associates) as secondary Abs, followed by a tetramethylbenzidine hydrogen peroxide substrate kit (Bio-Rad, Richmond, CA). The Ab titers were expressed as reciprocal end-point dilutions of the sera. Spleens were removed from mice on day 12 after primary immunization, frozen sections were prepared for immunohistochemistry, and NP-reactive GC B cells were identified by dual staining with peanut agglutinin (PNA) and NIP-BSA as previously described (15). Cells (∼100) from individual GC were microdissected (15, 31) and transferred into microcentrifuge tubes for PCR DNA amplification. The initial round of amplification used primers corresponding to the V186.2 genomic DNA 5′ transcription start site sequence and the intron JH2 sequence, respectively. An aliquot of the reaction mixture was reamplified using nested primers complementary to the initial 20 nucleotides of the V186.2 gene and to the JH2 segment, with additional restriction enzyme sites. The details of the PCR reactions and sequences of the primers were published previously (15, 32). The PCR product was digested with the restriction enzymes, ligated to a plasmid, cloned in competent Escherichia coli, and sequenced as previously described (32). The individual NIP+, IgG AFC were picked manually using 50-μl disposable micropipettes (Fisher Scientific, Pittsburgh, PA) and transferred into microcentrifuge tubes with PCR buffer, proteinase K, and Tween 20 exactly as previously described (20). DNA amplification of the crude cell lysate was conducted by two rounds of PCR using nested primers corresponding to V186.2/JH2 genomic sequences described above. The PCR product isolated with the QIA quick gel extracting kit (Qiagen, Hilden, Germany) was directly sequenced by the Biopolymer Laboratory of the University of Maryland School of Medicine using an automatic DNA sequencing system (PE Applied Biosynthesis, Foster City, CA). DNA codons are numbered according to the method of Kabat et al. (33). An error rate of 8.5 × 10−6 misincorporations bp PCR cycle is expected from the Expand High Fidelity polymerase according to the manufacturer. Thus, approximately five VDJ fragments (1715 bp) recovered from tissue by 80 cycles of amplification would be expected to contain one mutation attributable to the polymerase error. We found no mutations after sequencing six clones recovered from two independent amplifications of germline-encoded NP-reactive B1-8 hybridoma cells (V186.2, DFL 16-1, and JH2; not shown). Thus, we assume that mutations in excess of the theoretical average value (0.2 mutation/VDJ) have resulted from a somatic process. Mutation frequencies shown in Results are based on scores of base substitutions in the VH sequences only. Shared mutations within a set of clonally related sequences (according to the complementarity-determining region (CDR) 3 region) were counted as one mutational event. The sequences representing the V186.2 gene differed from their presumptive germline counterpart by up to 20 nucleotides, indicating that the V segments were somatically mutated or that they were derived from a different germline gene of the V186.2/V3 gene family (J558) (34). Distinction was possible because the nucleotide differences between the recovered sequences and the V186.2 germline sequence typically fell into the positions shared by members of the V186.2/V3 gene family and spared those positions that characterize individual germline genes. Thus, codons 11, 20, 43, 50, 74, and 91 (and others) that distinguish the 186.2 gene were never mutated. The data were analyzed by the Wilcoxon nonparametric test. The responses of aged mice to a single immunization with 10 μg NP-CGG in alum were overall diminished compared with young/adult animals. The formation of PNA+ GC in the spleen of aged mice was reduced by more than half (Fig. 1⇓a), as expected (14, 15); however, the proportion of GC that contained the NP-specific B cells was comparable in both age groups (Fig. 1⇓b). 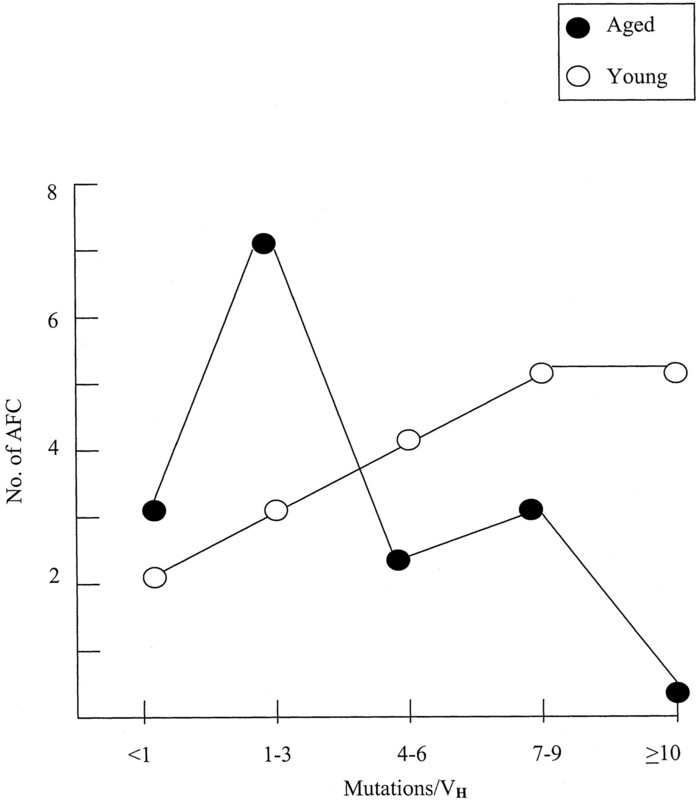 The IgG AFC response in the spleen was also lower, particularly during the early peak (Fig. 2⇓), yet the NP-specific AFC appeared, characteristically in the bone marrow of aged mice at later stages of the response (Fig. 2⇓b), although in smaller numbers compared with the young animals (Fig. 2⇓a). Serum IgG Ab levels in aged mice were reduced by 10-fold or more (Table I⇓). GC reaction in the spleen of young (○ and ▵) and aged (• and ▴) mice on day 12 after immunization with NP-CGG/alum. a, The number of GC is expressed as the percentage of follicles stained with PNA. b, The number of GC containing NP-specific cells is expressed as the percentage of PNA+ follicles double-stained with biotinylated NIP-BSA. Kinetics of NP-specific IgG-producing cells (AFC) as detected by hemolytic plaque assay in the spleen (□) and BM (⋄) of young (a) and aged (b) mice after immunization with NP-CGG. Three or four animals from each cohort were boosted with 10 μg NP-CGG/PBS on day 62 (arrows), and NP-specific IgG AFC were enumerated 5 days later in the spleen (▪) and BM (♦). Each point represents mean from three or four mice ± SEM (vertical bars). The effects of aging on the repertoire of GC were examined on day 12 after the immunization by microdissection of NP+/PNA+ B cells and PCR amplification and sequencing of the rearranged VDJ genes. The V186.2 segments recovered from GC B cells in aged mice contained fewer point mutations than the corresponding segments from the young mice (Table II⇓); however, the difference between the two groups was not statistically significant (p > 0.05) due to an overlap of mutation scores in individual centers. It appeared that the process of somatic hypermutation remained robust in some GC in aged mice (e.g., 21, 13b, and 19 in Table II⇓) even though, as previously shown (14), activity was reduced overall. This idea was also supported by the finding that some GC in aged mice contained V186.2+ B cells with replacement mutation Trp (W)→Leu (L) in VH33 (Table II⇓), which increases the affinity of anti-NP Ab by 10-fold (35) and is indicative of selection of GC B cells into the higher affinity memory cell population (36, 37, 38). The repertoire of AFC in the spleen and BM was sampled on days 35–65 after the immunization, and individual cells were examined by sequencing of VDJ DNA. Results from the young cohort, which were published separately (20), showed a marked, statistically significant increase in somatic diversity of AFC in BM over that in the spleen. 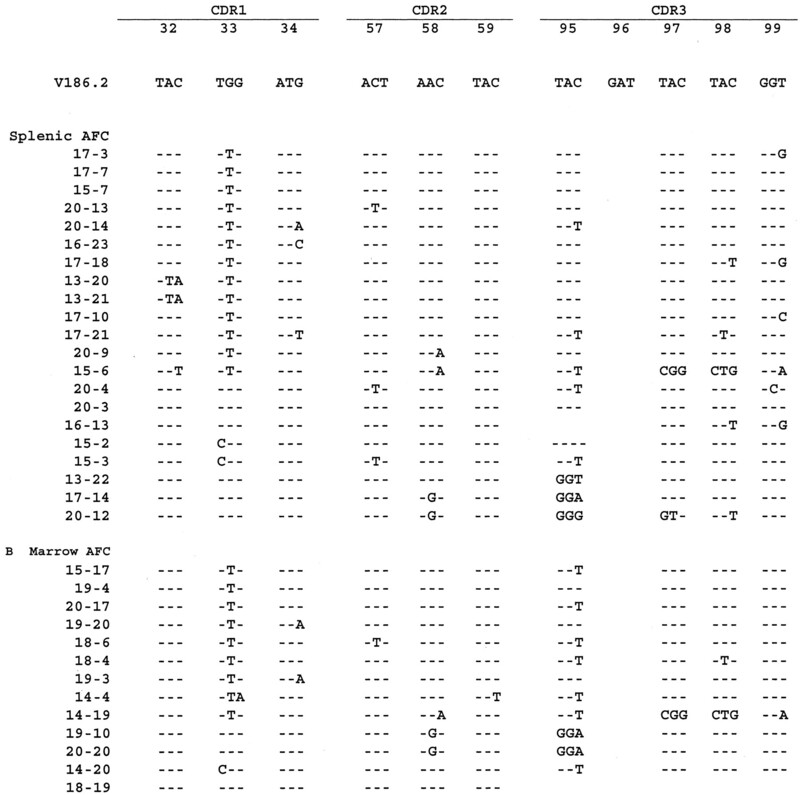 As summarized in Table III⇓, only half the splenic AFC in young mice were mutated, containing, on the average, three mutations per V gene, which is comparable to the GC B cells, whereas most BM AFC (89%) were mutated, and they accumulated nearly 3-fold more point mutations per VH (p < 0.01) Here we show that the aged mice also showed a greater accumulation of mutant AFC in BM (80% of cells contained mutations) compared with the spleen (38% of cells mutated; Table III⇓). However, in contrast to the young mice, the average frequency of mutations in BM AFC in the aged (four mutations per VH) did not increase over that in the spleen (five mutations per VH; p > 0.05; Table III⇓). The paucity of highly mutated AFC in aged BM is revealed in a mutation distribution plot comparing the young and aged animals (Fig. 3⇓). Despite this, it was found that in aged mice the AFC containing the signature W33L mutation were more frequent in BM (6 of 15 AFC) than in the spleen (1 of 16 AFC; Fig. 4⇓), suggesting that the aged BM may contribute to affinity maturation of primary anti-NP Ab. Distribution of mutations in the rearranged VH186.2 genes among NP-specific AFC in BM of young (○) and aged (•) mice in late primary response (days 35–65). Data for young animals were adapted from Ref. 20 . VH repertoire in aged mice after primary immunization. 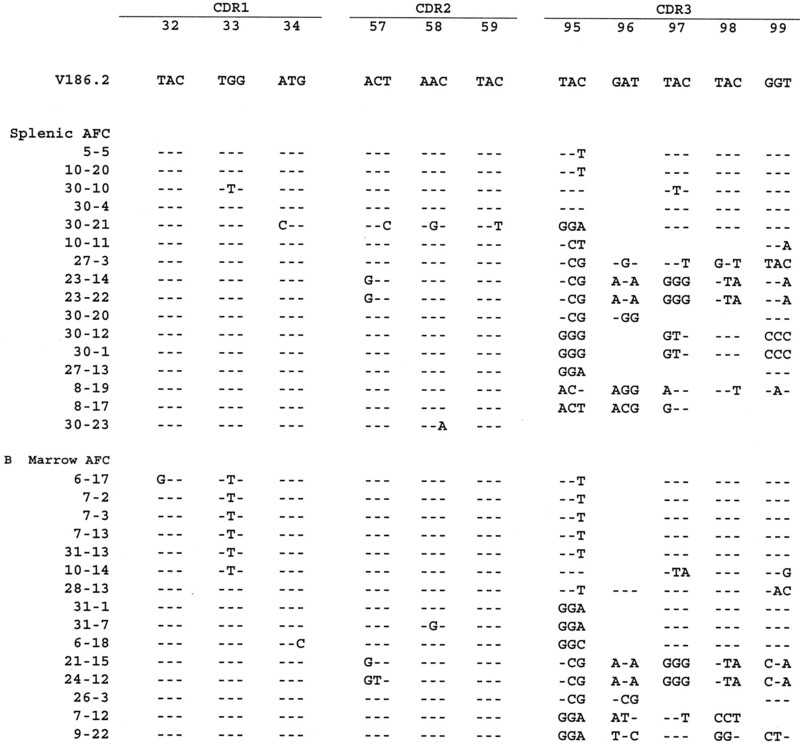 Partial nucleotide sequences of rearranged VH186.2/D genes recovered from individual AFC in the spleen and BM at late primary response (days 35–65) after immunization with NP-CGG/alum. The germline-encoded VH186.2 sequence is around positions 33 in CDR1 and 58 in CDR2, and CDR3 with part of the DFL16.1 segment is shown at the top. The positions of nucleotide changes in the sequences from individual AFC are indicated below. The repertoire of late primary AFC in aged mice was further characterized by a marked sequence heterogeneity in the V/D joint (CDR3 position 95–97; Fig. 4⇑) and by an infrequent usage of the DFL16.1/2 genes. The V186.2-DFL16.1/2 rearrangement was found in less than half of AFC from the aged mice (Table IV⇓), with other cells expressing various segments of the large DSP2 gene family (not shown), whereas most AFC from the young mice expressed the canonical V/D rearrangement (Table IV⇓). The CDR3 repertoire patterns in the late primary responses suggests that the selection of NP-reactive progenitors of AFC in senescent immune system becomes less constrained. The next question was how does immunosenescence affect the repertoire of NP-reactive memory B cells? Cohorts of NP-primed mice were challenged on day 62 with 10 μg of soluble NP-CGG/PBS, and the burst of IgG AFC was measured 4–5 days later. A rapid AFC response to the Ag boost (5- to 7-fold) was seen in both spleen and BM. Although the absolute numbers of NP-specific AFC in aged mice were lower, the relative increases in AFC per 106 cells after the boost in the aged spleen (7-fold, from 5 to 35) and BM (4-fold from 7 to 24; Fig. 2⇑b) were comparable, respectively, to those in the young spleen (7-fold, from 17 to 130) and BM (3-fold, from 25 to 80; Fig. 2⇑a). Analysis of V186.2/D rearrangements from NP-specific AFC that were recovered after the antigenic boost was insightful. All secondary AFC in aged mice were somatically mutated, containing, on the average, half as many mutations (five or six mutations per VH) than the secondary AFC from the young (11–12 mutations per VH; p > 0.01; Table V⇓). More surprisingly, the repertoire of secondary AFC in aged mice had the hallmarks of typical GC-derived precursor B cell that are found in young NP-immunized mice (36, 37, 38): shared W33L replacement, Tyr95, and canonical rearrangement V186.2/DFL16.1/2 (Fig. 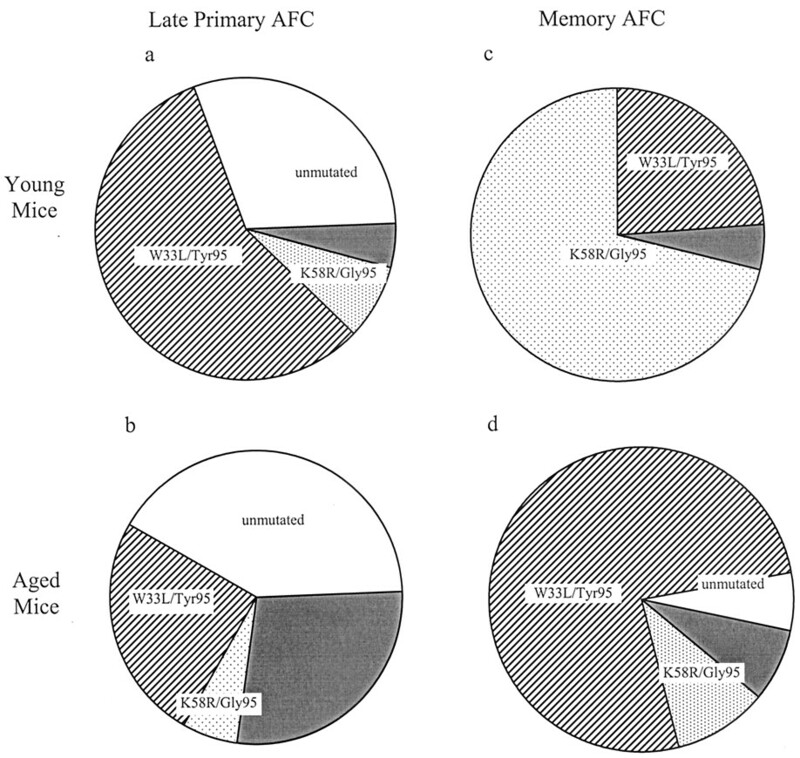 5⇓ and Table IV⇑); note that this clonotype was relatively rare in the late primary AFC in the aged mice (Fig. 4⇑ and Table III⇑). The distinct repertoires of NP-reactive cells in aged mice, the late primary BM AFC, and the AFC triggered by antigenic challenge are summarized in Fig. 6⇓, b and d. It can be seen that the anamnestic AFC in aged mice (Fig. 6⇓d) had a repertoire similar to that of late primary AFC in BM of young mice (Fig. 6⇓a). In contrast, as detailed previously (20), the anamnestic AFC in the young represented a novel clonotype that is seldom found among NP-specific GC B cells (Fig. 6⇓c); most AFC shared a mutation that replaced lysine (K) with arginine (R) in position 58 (instead of the W33L) and an N residue Gly95 (instead of Tyr95); such cells were virtually absent from the repertoire of anamnestic response in aged mice (Fig. 6⇓d). VH repertoire in aged mice after secondary immunization. Partial sequences from anamnestic AFC recovered from the spleen and BM of aged mice are shown. Mice were immunized as shown in Fig. 2⇑, and AFC were obtained on day 5 after the Ag boost. Data are presented as described in Fig. 4⇑. Graphic representation of somatic mutation patterns in VH186.2 in AFC from young (a and c) and aged (b and d) mice during late primary (a and b) and anamnestic (c and d) responses to NP-CGG. The size of each pie section is proportional to the following AFC: unmutated (□), mutants with W33L replacement and Tyr95 (▨), mutants with K58R replacement and Gly95 (▩), and mutants w/o the recurrent replacements (▪). The diagram shows combined results from splenic and BM AFC; the data from young mice were adapted from Ref. 20 . The present study shows that BM does indeed function as a site of late Ab production in aged mice, although the numbers of AFC are lower than those in young animals in proportion to the diminished primary response. The VDJ repertoire of NP-specific AFC in aged BM had two characteristic features that shed light on the process of immunosenescence. First, there was a large proportion of cells with noncanonical V186.2/D junctions and limited use of the DFL16.1/2 gene segments that are expressed by virtually all AFC in young mice. The low usage of DFL16.1 gene in our sample of aged AFC (42%) appears to be at variance with the report of Miller and Kelsoe (14), who found that 80% of B cells in aged GC contained the V186.2/DFL1.1 rearrangements. A discrepancy in repertoire could result from sampling of different B cell populations by different techniques. Miller and Kelsoe (14) sampled all GC that stained positively for λ-chain, whereas we selected the AFC on the basis of their reactivity with NP. It is likely that only some GC cells survive the selection into productive AFC (18, 19, 20), resulting in a repertoire shift between the two compartments. 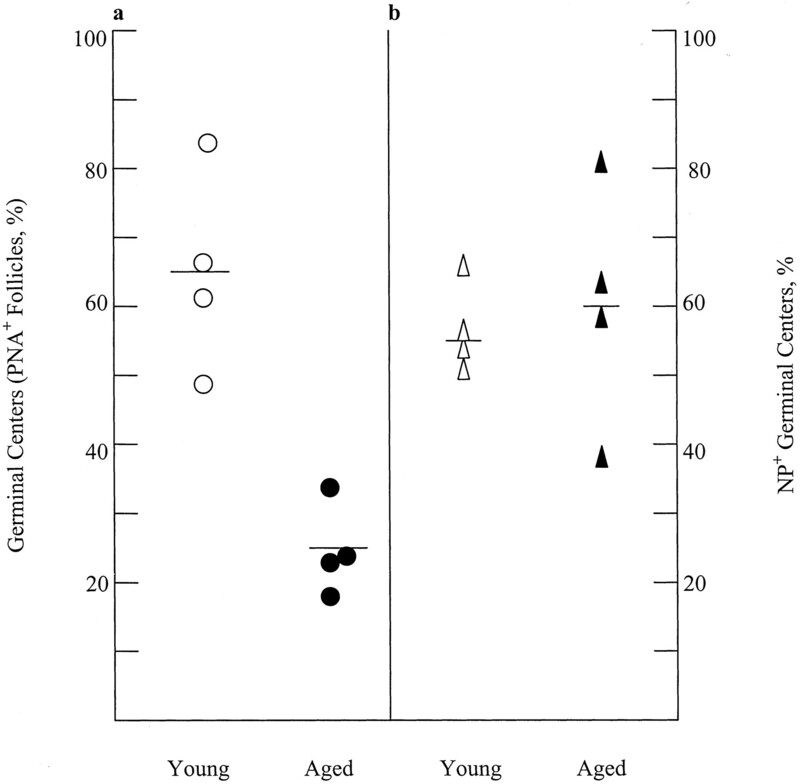 Also, the GC repertoire in aged mice showed a strong founder effect, in that an entire GC was either DFL16.1 positive or negative (14), which could complicate a comparison between different age groups. The researchers did not include young mice in their study (14); however, earlier data from the laboratory showed that the V186.2/DFL16.1 rearrangements in the GC in young mice ranged from 16–67% (31). We found it interesting that the skewed pattern of V/D diversity, which was observed in aged AFC in both BM and spleen, is strikingly similar to the pattern that was found by Takahashi et al. (25) in young mice expressing the bcl-xL transgene. Overexpression of bcl-xL (24) or bcl-2 (24) causes a promiscuity in affinity-based clonal selection in GC due to inhibition of apoptosis. The present data suggest that aging may similarly compromise the GC selection process, although the exact mechanism remains to be determined. The second observation was that the aged BM was enriched for somatically mutated AFC to the extent that is seen in young BM, except that highly mutated cells (≥10 mutations LVH) were rare. Moreover, 50% of the mutant AFC contained the VH replacement W33L that is associated with increased affinity of anti-NP Ab (35). Therefore, it appears that the general process of repertoire maturation in BM is partially operative even in very old mice. Why the Ag-specific B cells/AFC in BM are more somatically mutated than the cells in the spleen is not known. It has been proposed that the mutated B cells/AFC may home selectively to BM (18, 39), that BM provides stimuli for mutation and selection in situ, or both (19, 20, 40). The pattern of mutations in BM AFC observed in aged mice, i.e., a high proportion of mutants with fewer mutations per cell, is consistent with the possibility that both hypothetical mechanisms exist, and that immunosenescence spares the homing mechanism, but compromises the in situ activity. The apparent retardation of somatic mutation in aged mice is reminiscent of the pattern that has been observed by Diaz et al. (41) in mice with disrupted expression of DNA polymerase ζ. The NP-activated B cells in these mice contain fewer somatic mutations; however, the frequency of mutations increases slowly with prolonged Ag exposure. The authors postulated that a slow kinetics of repertoire maturation may be proportional to the low rate of mutation. It is thought that BM AFC, like the memory B cells, originate in splenic GC (39). However, the repertoire maturation of these two cell populations appears to be independently regulated (18, 20, 24, 25). This view is further supported by the present finding that the repertoire of anti-NP anamnestic response in the spleen and BM in aged mice is markedly different from the repertoire of AFC present in BM at the time of Ag boost. Although the AFC were sampled randomly, the sharp increase in cell numbers after the boost and the similarity of results in the spleen and BM warrant our inference that the sample was representative of memory AFC. These cells expressed the canonical V186.2/DFL16.2 joints and were uniformly mutated, including the W33L replacement. Thus, the anamnestic anti-NP response in aged mice had all the hallmarks of NP-specific precursor memory B cells that originate from functionally competent GC (36, 37, 38) and, upon stimulation, produce Abs with affinities from NP ∼10-fold higher compared with the primary, germline-encoded Ab (35, 36, 42). In this model, then, the aged immune system has demonstrated a potential for significant maturation of memory repertoire. However, the aged mice failed to reach a higher order of memory, i.e., cells that produce anti-NP Ab encoded by V186.2/DFL16.1 genes with a distinct N residue, Gly95, germline-encoded Trp33, and the K58R replacement, which dominated the anamnestic response to NP in young mice (19) (see Fig. 6⇑). Affinities of such Ab for NP can increase by another 1–2 logs according to Furokawa et al. (42). It is apparent that aged mice develop immunological memory after the primary immunization, but the repertoire is less well developed compared with that in young animals. Whether the process is merely slower in the aged or whether there is a limit to the repertoire maturation is an important question that should be addressed in future experiments. If the first alternative is correct, it might be possible to restore the Ab affinity in aged animals by repeated immunizations. Such animal studies could eventually help to design proper vaccination schedules for the elderly population. We thank Dr. Martin Flajnik for his constructive comments on this manuscript. ↵1 This work was supported in part by U.S. Public Health Service Grant AG08193. ↵3 Abbreviations used in this paper: GC, germinal center; AFC, Ab-forming cells; BM, bone marrow; CDR, complementarity-determining region; CGG, chicken γ-globulin; NIP, (4-hydroxy-5-iodo-3-nitrophenyl)acetyl; NP, (4-hydroxy-3-nitrophenyl)acetyl; PNA, peanut agglutinin. Gearhart, P. J.. 1993. Somatic mutation and affinity maturation. W. E. Paul, ed. Fundamental Immunology 865 Raven Press, New York. Kabat, E. A., T. T. Wu, H. M. Perry, K. S. Gottesman, and C. Foeller. 1991. Sequences of proteins of immunological interest. U.S. Dept. Health and Human Services, Washington, D.C., National Institutes of Health Publication 91-7242.